Right after a huge win, the coach usually gets doused with Gatorade. 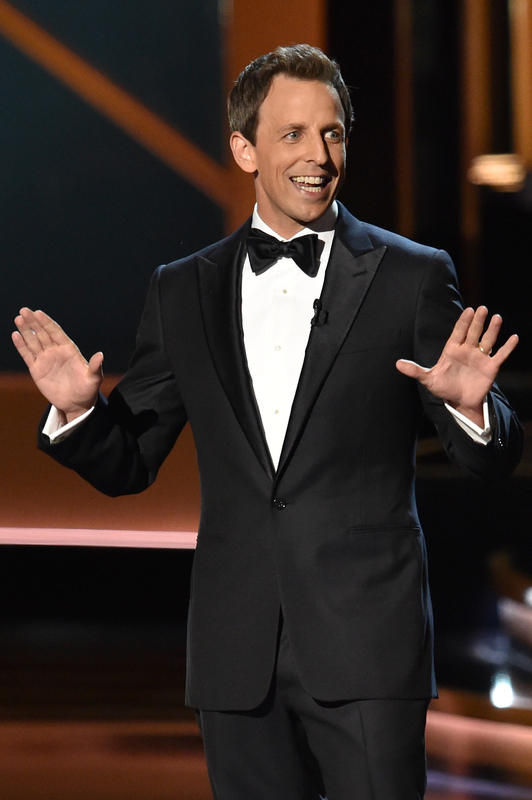 Right after Seth Meyers wraps his 2014 Emmys hosting gig, he throws a bucket of ice water over his head. Is he celebrating a job well done? Maybe, but this bucket is one you're familiar with. Meyers took the ALS Ice Bucket Challenge just off-stage of the Emmys; In a white shirt and black bow-tie, the comedian acknowledges the challenge received from Jessica Biel and his cousin, challenges Vladimir Putin (natch), and braces for impact. Guess what? He gets wet. During an otherwise uneventful Emmys, the old Ice Bucket Challenge is a welcome addition. It's like an old, familiar, talkative friend that you normally ignore at parties, but dang, when there's no one else to focus on, they can provide a life-saving island in a sea of boredom. "Hey, Ice Bucket!! What's up, man?!? So good to see you!!" Because after some cringe-worthy lines, the Orange Is the New Black snubs, and the palpable lack of diversity, it is time to lean on an old stand-by. As Meyers makes his way to his dressing room, or straight to a fancy Emmys party, here's hoping he has only one thing on his mind. Well, two. One, getting out of that wet shirt, and two, getting in touch with Putin. A Putin Ice Bucket Challenge needs to happen. Donations, encouraged.